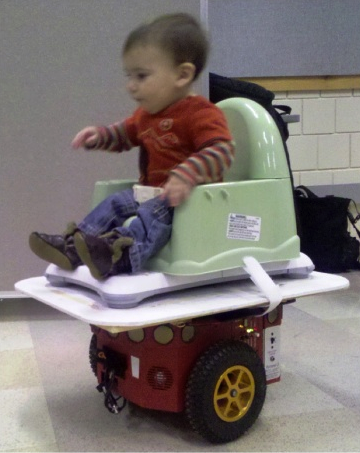 Some children suffer from disabilities which prevent them from crawling around and exploring the world, but thanks to projects like this one they might have an alternative way to move around: Baby-sized motorized chairs. This particular robotic chair consists of a Wii Fit Balance Board which has a child seat strapped to it. The Balance Board is there to instruct the robot to travel into whichever direction the child leans. This is rather clever because kids are prone to leaning in the direction of an object they wish to reach or are interested in.